In travel vocabulary, there’s a big difference between a trip and a voyage. The dictionary may define them as synonymous, but trip covers a wide range of travel styles. It is utilitarian in feel, while there’s an allure to a voyage. Voyage evokes the nostalgia and the luxury of a time passed. Late last summer, I voyaged with Azamara Club Cruises and fell in love with Kotor, Montenegro. 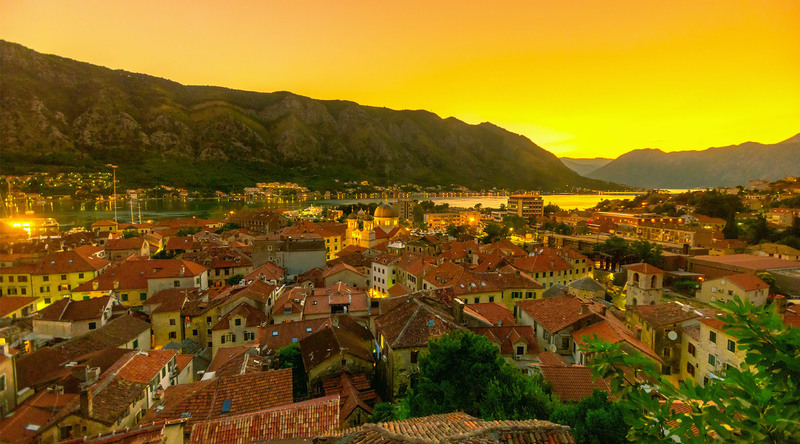 Perched above the Adriatic Sea on limestone cliffs, the walled city of Kotor dates back to medieval times and has maintained its twisting streets, town squares and Roman-style churches. Built between the 12th and 14th centuries, Kotor is a UNESCO World Heritage Site. As soon as the Azamara liner entered the Bay of Kotor, I couldn’t wait to explore. Truthfully speaking, sometimes it’s an effort for me to pull myself away from the onboard luxury and pampering. But I had 24 hours in Kotor and I was going to make the most of them. I’m more of a hiker than a poke-my-head-into-all-the-shops type, so I set my sights on climbing the city walls to get a spectacular view of the fjord-like Bay of Kotor. The theory was that at about 1,350 stairs later, I’d be at Castle of St. John, or Castle of San Giovanni, with its unparalleled view of the walled city of Kotor and the pristine Bay of Kotor bordering it. Did I mention how hot it was that day? It was so hot that August day that I only made it a third of the way. For someone as competitive as I am, that’s a humbling sentence to write. I was well prepared with plenty of water, good shoes, and proper dress. The weather just did not cooperate. When you venture on this hike, be sure to have plenty of water, as the price increases as you trek your way up the stairs. A couple of other details to keep in mind are the €3 admission from 8:00 a.m. to 8:00 p.m. You can enter for free before or after the official times. Allow two hours to complete the hike from Kotor’s North Gate to Castle of St. John and back. Though it was HOT that day I was able to walk around the medieval-era walled Old Town, which is car free and situated across the street from the city’s cruise ship dock. Even with making it only part of the way to Castle of St. John, I was struck by the views from the walls. I’m going to plan a return trip in cooler weather so I can finish the hike to Castle of St. John. Have you ever traveled somewhere so picturesque you felt the need to return? Where was it? And how hot was it? Cruise to beautiful Kotor, Montenegro with Azamara! Browse upcoming voyages here.